A person does not have to be religious to recognize the importance of the Ten Commandments on western civilization, literature and life. Even when one disregards their intrinsic merit, their literary significance remains. That said, it is important that those who consider themselves well educated should be acquainted with the message of this foundational document. The statistics reveal a rather surprising picture. 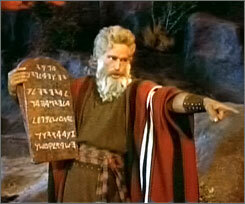 It turns out sixty percent of Americans cannot identify even half of the commandments. What I find stunning about that is the fact that since they are mostly prohibitions of destructive behavior, even the illiterate should be able to guess half of them. “Okay . . . we shouldn’t commit murder . . . steal from others . . . or lie about and slander others.” Pretty common sense, and we’re already over halfway there. Since our world has programmed us all with insatiable materialistic desires, it’s probably unlikely that someone would “guess” that coveting our neighbor’s property is wrong, so let’s substitute a more likely alternative. Congratulations, we’ve reached our goal of five. As for the enumeration of the commandments—which varies among Jewish, Roman Catholic and Protestant communions—that’s a subject for another day.